Portable display stands are designed with functionality and versatility in mind. They offer you some of the most high quality and cost-effective display systems on the market. 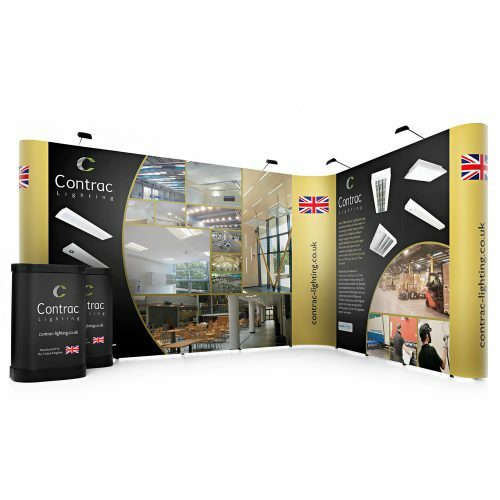 Whether you are new to the world of exhibitions or if you are a veteran of the trade, portable exhibition stands will offer something to suit you and help you showcase your business to its full potential. Portable displays are available in a huge range of sizes and configurations. Each display can be assembled within minutes and requires minimum effort. Regardless of the size of the display you choose, portable displays retain their effortless transportation and storage properties. 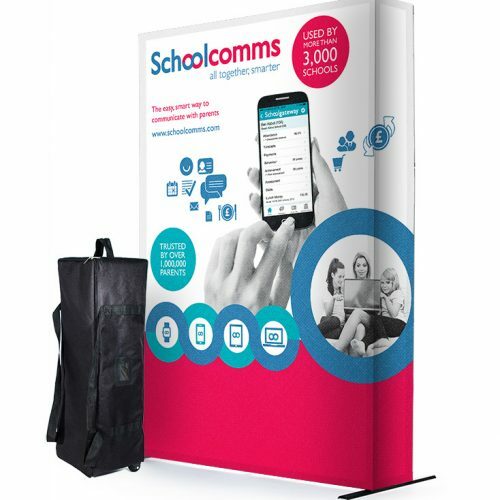 This makes them ideal for businesses who want to get the most out of their trade show display investment. 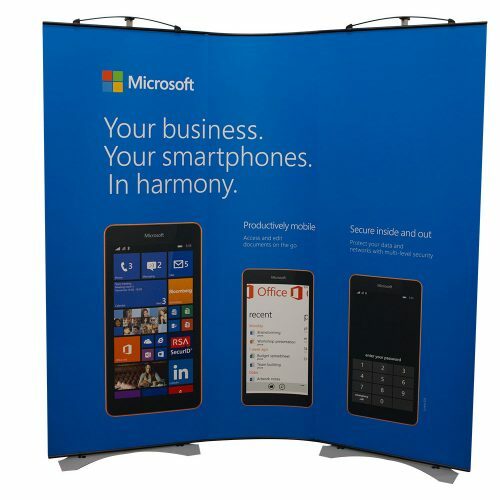 Pop up stands are an industry standard due to their usability, versatility and portability. 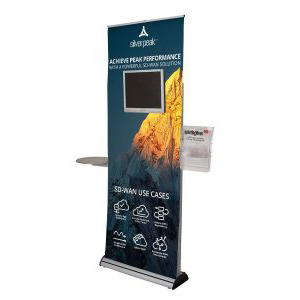 Pop-up display stands are our best-selling portable display solution. 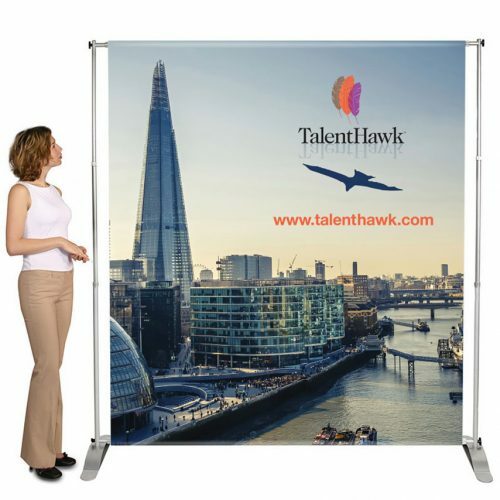 Fabric exhibition stands offer versatility, easy assembly and seamless graphics with edge to edge marketing exposure. 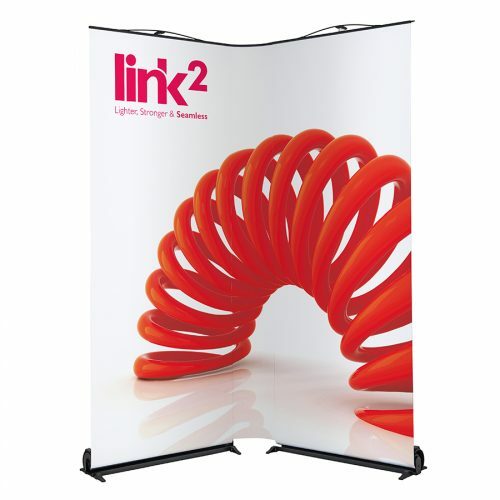 Rollers banners are one of the oldest and most used exhibition display solutions. They offer an easy and cost-effective way of marketing your business. Twist banners are the most flexible and versatile banner systems available and can adapt and change alongside your needs. 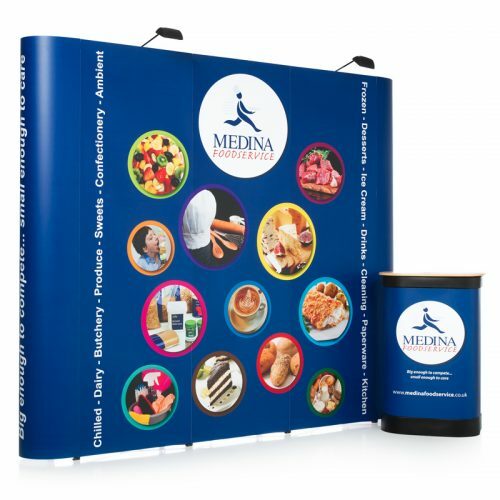 Pop up display stands are an industry standard when it comes to exhibiting. 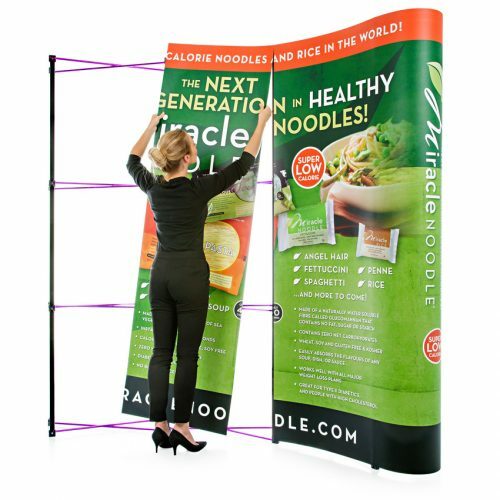 Pop up stands provide maximum back drop coverage. They are a great choice if you are looking for a versatile and reusable display. You can build a pop up stand in minutes without tools or special training. Each pop up is supplied with a wheeled case that easily fits into any car for effortless portability. 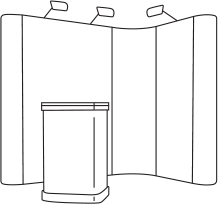 You can use linking panels to create a large scale linked pop up exhibition stand. They can be configured to any shape and size to suit your exhibition space, and regardless of size, they still retain their easy assembly. The frame simply pops up and the the graphics are self-locating. This means you don’t have to fiddle with the graphics because they attach themselves. This then means that you can spend more time on your customers and less time on assembling your display. 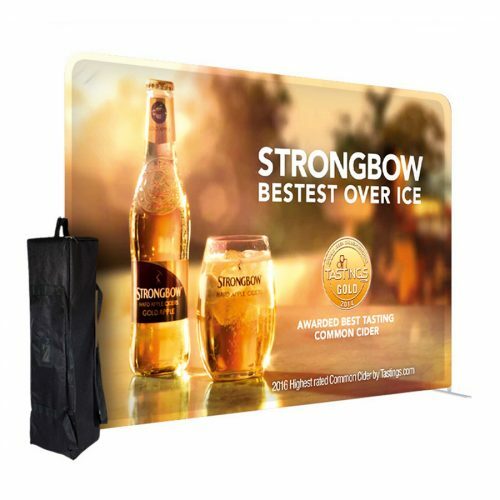 If you want something bigger, we offer 3m high jumbo pop ups to really make your brand stand out at large format events. We print all of our graphics in-house and in full colour to an exceptional photo finish. We also laminate each panel to ensure the longevity and vibrancy of your product. 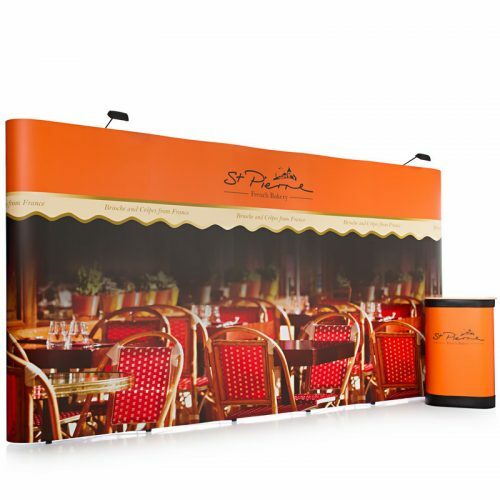 Fabric exhibition stands create professional and seamless exhibition displays, designed to captivate audiences and add value to your brand. 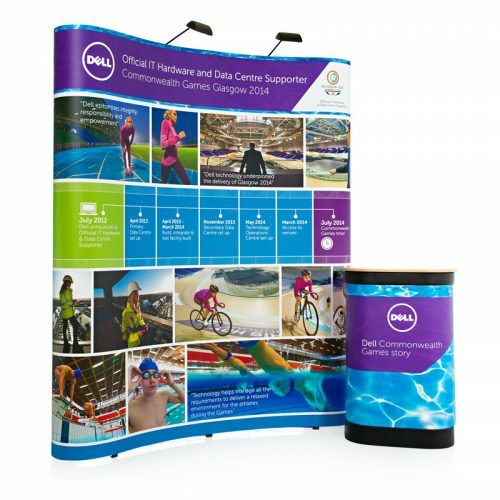 Built using a lightweight yet sturdy aluminium frame, fabric display stands add vibrancy, helping your business stand out. 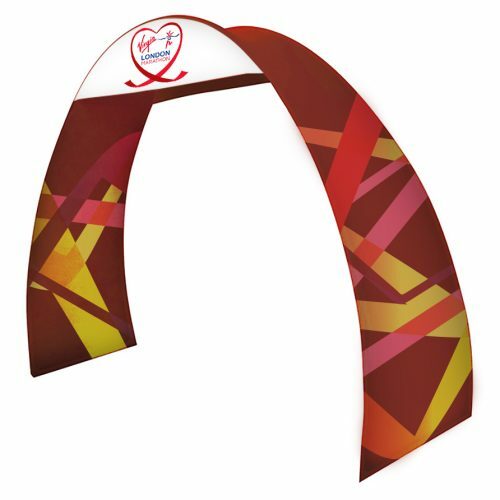 They are available in a range of shapes and sizes to suit every marketing need. 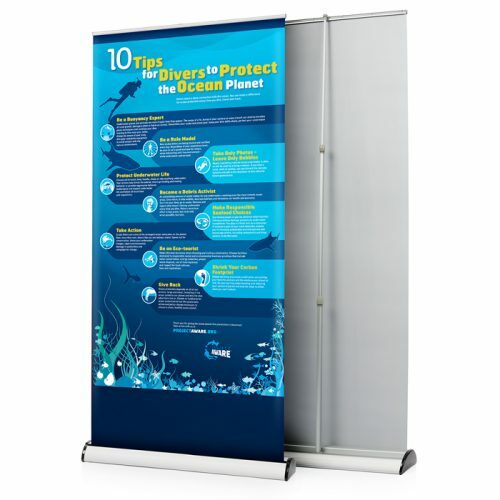 Fabric display stands use a tension fabric system and are extremely easy to put together. You simply build the frame and slide the one-piece stretch fabric sock over the top in minutes. The tubular frame has an elastic band inside it for an easy push-fit assembly. The poles simply line up and slot together, therefore allowing you to focus more on your business and less on your stand. The one-piece sock means there are no unsightly joining lines in your graphics, giving you edge to edge graphic coverage. 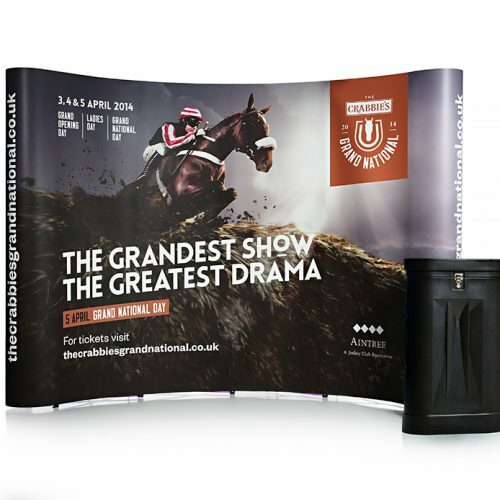 All of our fabric display stands are manufactured and printed in the UK using a dye-sublimation process. This means that your product will not crack, fade or peel – ensuring maximum longevity and value for money. We offer a large variety of roller banners to suit any marketing need or budget. With prices starting from just £49, you can choose from single-sided, double-sided, large format, quick-change graphics and even outdoor pull-up banners. 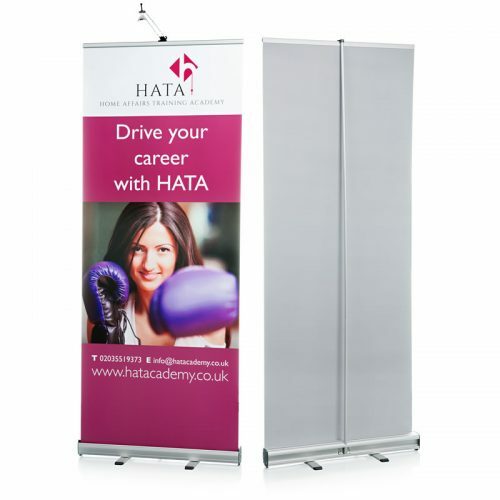 Retractable banners either by themselves or as part of a larger display. They are compact in terms of storage and floor space, but big on impact. 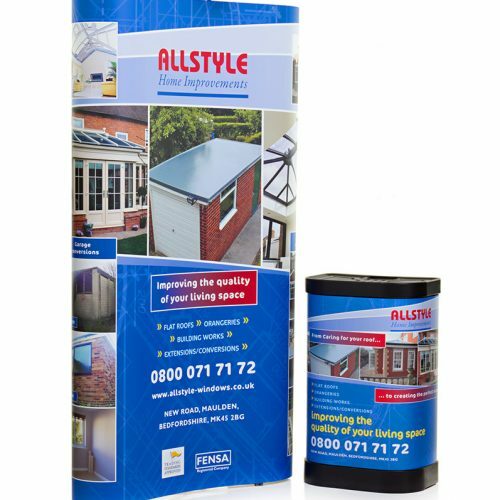 You can use roller banners anywhere, from retail spaces and exhibitions to trade shows and product launches. 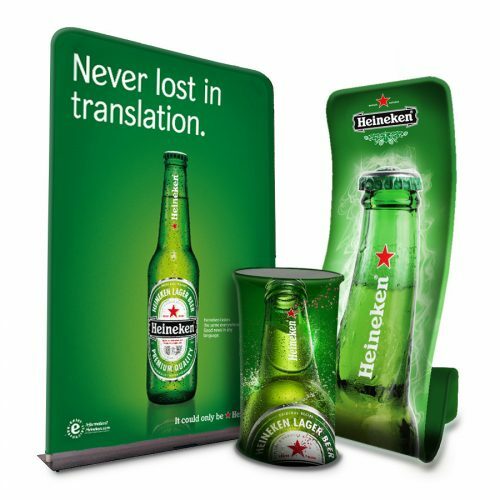 Lightweight and highly portable, banner stands offer you flexible brand promotion and can be used again and again. You can simply pull up the graphic in less than a minute. Assembly couldn’t be easier. Banners are one of the most cost-effective marketing solutions on the market. 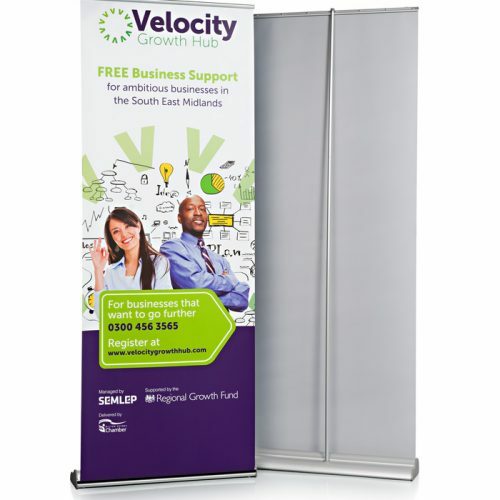 Regardless of your budget, there is a banner stand to complement any business. The great thing about retractable banners is their ability to hold accessories. 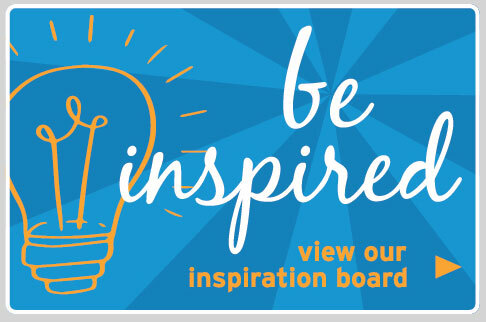 By adding spotlights, you are able to highlight key elements of your banner. If the exhibition hall is dim, you can create an inviting glow for your stand easily with LED lights. Literature stands are easy to affix and allow you to market key information without taking up floor space. 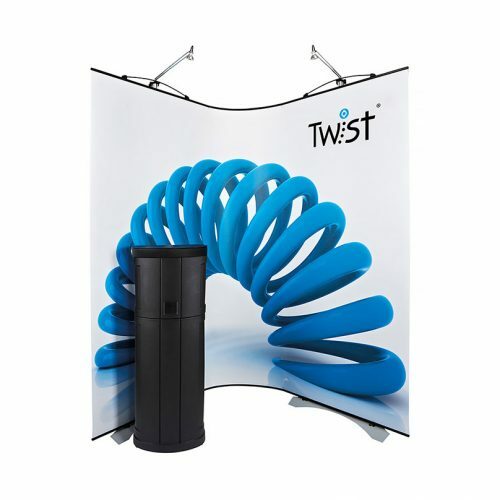 Twist banners use a unique patented tension design to keep your graphics taut and aligned, even on an uneven surface. Twist makes it incredibly easy for you to switch out components in order to adapt your display stand. This means it is perfect for keeping up with your business’ ever-changing marketing needs. 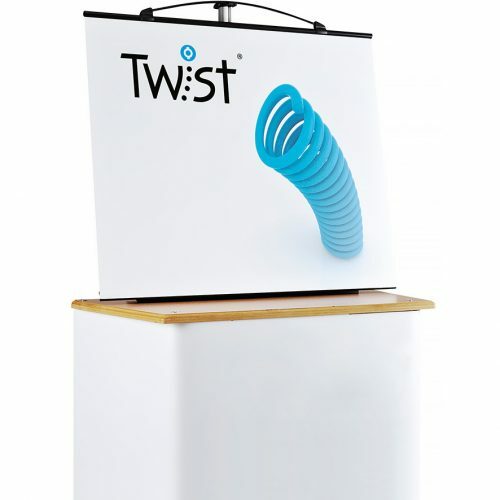 The tool-free assembly enables you to assemble a Twist banner stand in minutes. 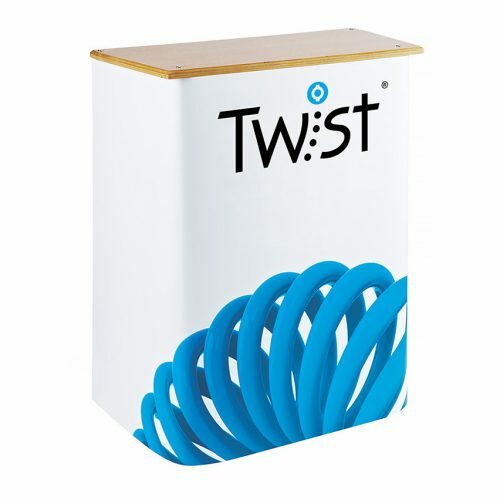 You can use Twist as a standalone banner or you can link several together using flexi-panels to create a large format modular display. By investing in a Twist banner system, you are making a long-term purchase that will save you money in the future. The versatility of Twist banners mean you can use them several times at different events. 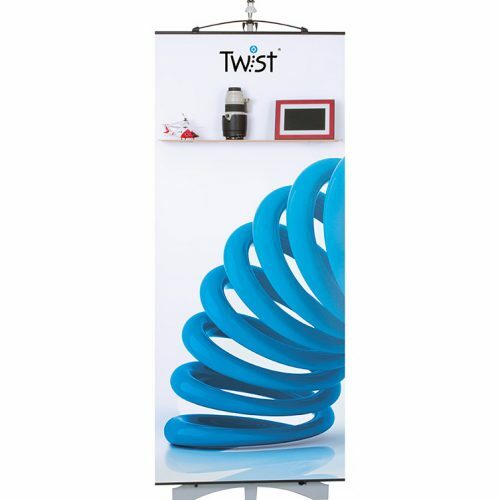 A wide range of accessories are available for your Twist banner to complement your exhibition stand. Spotlights allow you to highlight key aspects of your display and create a warm and inviting glow. Literature can easily be added by attaching a shelf to your banner. This allows you to get those all important marketing details distributed on paper without taking up precious floor space or making parts of your stand look bulky and ugly.